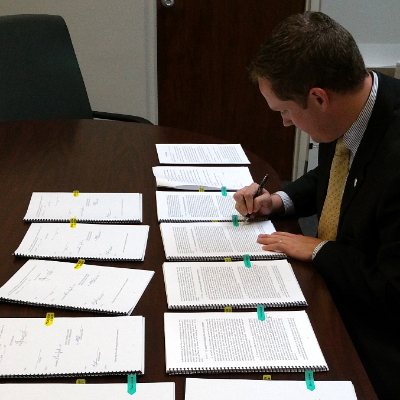 Signing these documents approving the sale of our power plants to Duke Energy after unanimous support by the City Council is probably the most significant honor I've had as mayor. Our #1 issue for at least 2 decades has been our electric rates and, coming this Fall, assuming all 32 cities approve, we will have similar rates as Duke / Progress. We will reduce our debt by $181.8 million upon complete approval. Too many people to thank, so when you see them be sure to thank the Council members, City Manager, public services director and our Electricities team. City Councilman Robbie Swinson, who serves on behalf of Kinston and the 32 cities (aka NCEMPA), will have a letter to the editor published soon regarding this transaction. Copyright © 2015 Committee to Elect BJ Murphy, All rights reserved.